What might we create? What are the fruits of creative inquiry? We asked people across the university and beyond and assembled a list of over 120 different end points, most of which require interdisciplinary collaboration. Fruits of creative inquiry include new knowledge, new medicine,. And we want engineers and artists and accountants to create social movements and anthropologists, chemists, and psychologists to create new drug delivery systems. Some of these innovations come to life in a short amount of time while others need months, years, decades. Advancing innovations through their life journeys presents umpteen opportunities for Creative Inquiry. 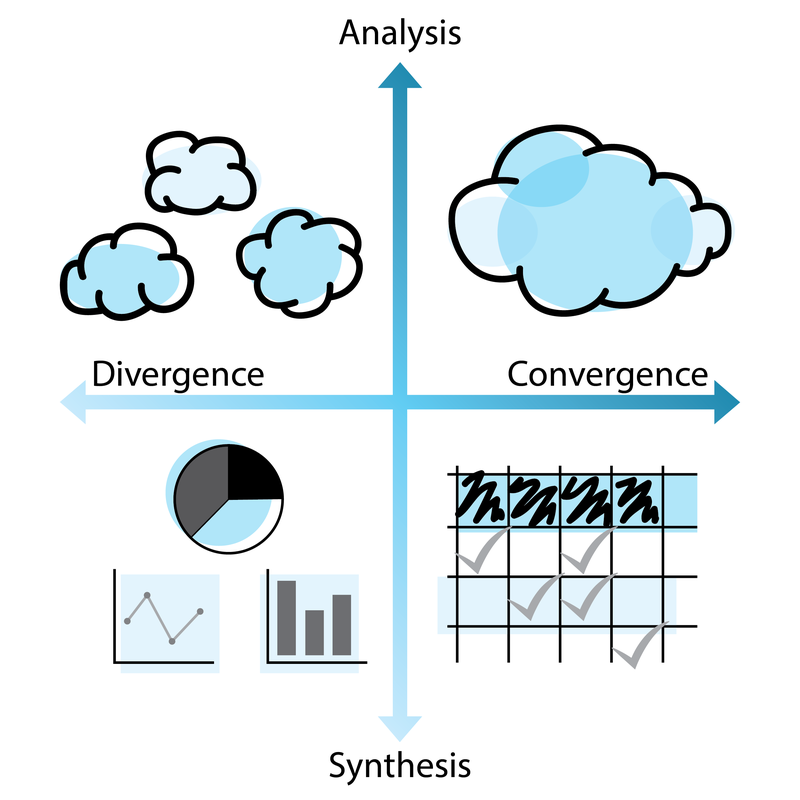 Diverging to explore the problem space and converging on a solution...and repeating over and over again to advance the project forward. A series of incremental, lateral innovations often lead to a step-change in knowledge and praxis. Just like the 3,000 prototypes and experiments that led to the incandescent light bulb. Every iteration presents opportunities for Creative Inquiry. You need to iterate your ideas many times, take new pathways, learn from failure, determine what works, converge that new knowledge back together, and set off on divergent pathways once again. It is a never-ending process, and along the way, ideas become inquiries that become fruits of innovation that improve the human condition. While engaging with diverse stakeholders, we conduct inquiries that lead to research questions that lead to new knowledge which is shared through various formal and informal channels. 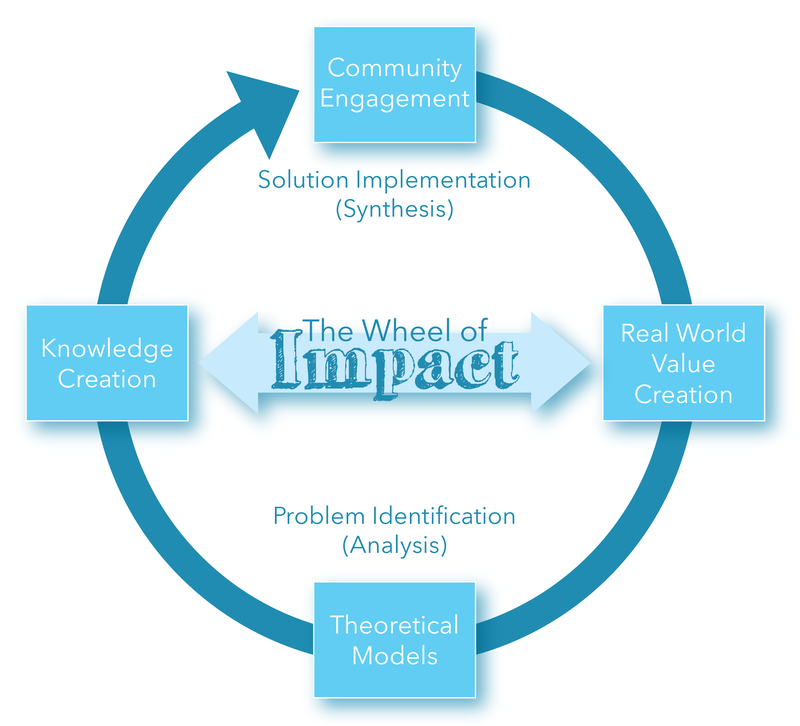 In collaboration with communities of practice, this new knowledge is synthesized into new or improved solutions that make life better. As academics, sometimes we are the connectors, sometimes the facilitators, and sometimes we take on the role of executors that deliver impact. While engaging with the world around us, we get inspired to ask better and deeper questions. And the cycle begins again. Every turn of the wheel presents opportunities for conducting inquiries and traversing the journey from inquiry to impact. Identifying a notion; exploring it...and you never know what you might discover or invent or help understand. Posing an idea or question and pursuing an answer....leading to more questions and answers. Identifying a need / challenge / opportunity and finding ways to solve it. Observing something interesting; try to understand and explain it.